In partnership with many groups and organizations, this event is designed to educate the community, also to honor the loved ones who have passed away by building a community alter. There is face painting, live music, car show and dance performances. Death as an encounter with the unknown has had different manifestations in different cultures, whether through literature or music, or through customs and sacred rites. The fear and taboo surrounding death in today’s Western civilizations is understandable, but Mexican culture has been able to give it a very particular comprehensive, solemn and festive point of view, which allows Mexicans to accept death. Death is a process, a journey to heaven. Calaveras are a reminder to enjoy life and embrace mortality. The calavera is a way of acknowledging that life is sacred and that death is a rite of passage. In Mexico, the inevitable should not be feared or avoided but faced with smiles and celebrations. Mexico’s historic Aztec culture and its old beliefs still prevail until today. The pre-Spanish indigenous people who lived in the territory of what we now call Mexico, had a concept of death quite different from that which would later come with conquest. The early known celebrations date back 7000 years ago. 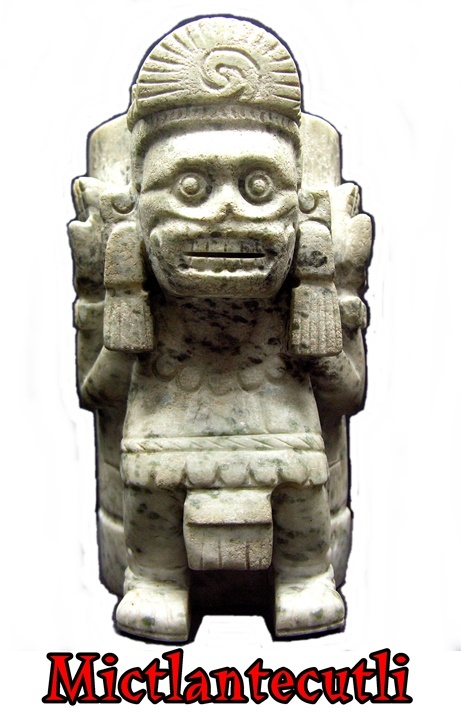 They were adapted by various indigenous people, then by larger indigenous nations like the Olmecs (1200–400 BC .) and by the Aztecs (1100 CE – 1521 CE). The Aztecs believed that dying was the beginning of a journey to the underworld, also called Mictlán. There are several theories about Mictlán as a city of the dead, but all agree that this kingdom was separated by the 13 heavens and 9 underworlds Mictlan. Each traveler, depending on the life he or she had taken, should be addressed to one of them. Funerary rituals were sacred to the Aztec and Mayan cultures. When a loved one died, the body was buried with different objects: among them were the belongings of the deceased and those elements that the relatives believed the traveler could need in his journey to the underworld. Mictlan was reached by the dead only after wandering through obsticles for four years beneath the earth, accompanied by a “soul-companion”, a dog which was customarily cremated with the corpse. At the end of the journey, thier souls would be at rest. Dia de Los Muertos was originally celebrated on the Aztec Calendar 7th month June 2nd through the 10th month August 20th. June 2-21 (7th Month) Tecuithuitontli “Lesser Feast For the Revered Ones”. (June 21st Longest Day of the year) June 22-July 11th (8th Month) Hueymiccaihuitl Tecuihuitl “Greater Feast of the Revered Ones”. July 12- July 31st (9th Month) Tlaxochimaco Miccaihuitontli “Birth of the Flowers and Feast for the Revered Ones. In honor of the Deceased Children”. August 1- August 20th (10th Month) (Xocotl Huetzi-Falling Fruit) Miccalhuitl Hueymiccailiuitl “Great Feast of the Dead. Celebrations took part on phases of the moon. After the arrival of the Spaniards, the expansion of Christianity began and with it, a break of the cultures and traditions of the of the indigenous people.. The concept of hell and heaven was introduced for the first time in that society as punishment or reward. The Spanish missionaries changed the dates of these Aztec festivals to the Christian Feasts of All Souls and All Saints day. They were times where the syncretism reigned and they went assimilating some beliefs along with others. In the colonial era, although many of the traditions of the ancient peoples were almost lost, Christian evangelization also encountered strong resistance on the part of the natives. To take away their traditions was to take away their identity, and that was something the indigenous Mexica were not willing to negotiate. 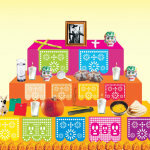 Today, the Day of the Dead party is a combination of different cultures and beliefs. In Mexico’s tradition, people die three deaths. The first death is when our bodies cease to function; when our hearts no longer beat of their own accord, when our gaze no longer has depth or weight, when the space we occupy slowly loses its meaning. The second death comes when the body is lowered into the ground, returned to mother earth, out of sight. The third death, the most definitive death, is when there is no one left alive to remember us. 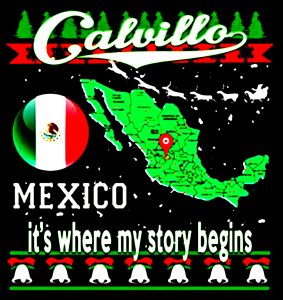 Mexico is a multicultural country that knew how to preserve its ancient rites and, in turn, add different meanings and traditions of various peoples and cultures. Death is the central character on this day, which is represented through multiple elements and rites. Among the main rites, we have the creation of skulls, which are a kind of humorous epitaphs for people who are still alive. In this way he jokes with and through death. 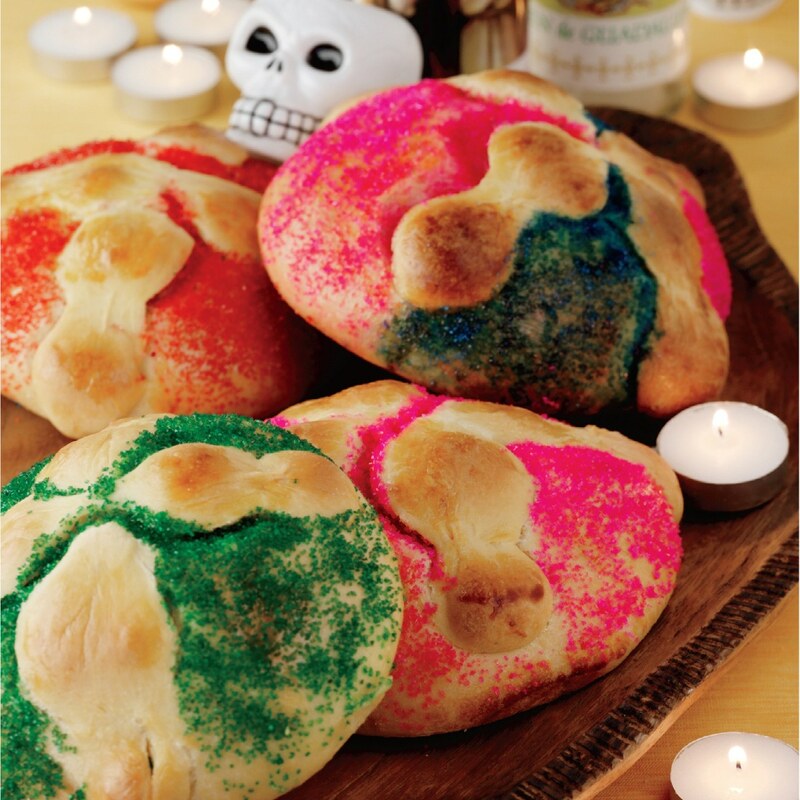 The so-called Pan De Muerto “dead bread” can not be missing either. This is a traditional dish that consists of a sweet bread to which some strips of dough are added as “bones” of decoration. Yellow flowers are also tradition on this date, it is believed that they guide the soul to reach their relatives. The altar of the dead is the maximum expression of this celebration. The altar is a symbolic construction to pay homage to the dead, consists of the creation of an altar in the home where candles, flowers and food are put up as an offering for the deceased. VASE OF WATER: It is a symbol of purity, it also serves the spirit to refresh after his journey through the other world. CANDLES VELADORAS: It is the light that guides the deceased in their journey to the material world. MIRROR: It represents the only way in which the deceased can see his spiritual form when he arrives to take his offerings at the altar. BREAD OF DEAD PAN DE MUERTO: represents the body that the person lost when embarking on his journey through the other world, the lines on the bread of dead signify his bones as well as the cane. CLOTHING: Garments of the deceased are also placed so that the spirit remembers his physical form. PUMPKINS: Represents the skull or head that the spirit left on the ground when dying. CERÁMICA DOG: Mexican belief said that when people died, people had to cross a river to get to paradise, so a dog helped them to cross safely, it also removes the evil spirits from the altar. SUGAR CANE CAÑA: Represents the skeleton that the spirit lost when dying, generally they are crossed like a religious sign. TOYS OR PHOTOGRAPHS: If the deceased is a child, toys are placed on the altar for the spirit to play, if it is an adult, photographs are placed of when they lived or some personal object. SALT: Symbol of purification and preservation of the body, it is also the way that the deceased must follow up to the altar, can be placed in cross form to protect the spirit. CALAVERAS: They are placed on the altar to remind the person who no longer belongs to this world. PAPEL PICADO: They mean the threshold between the world of the dead and the world of the living, used with images of skulls, in colors such as black, orange and purple (Advent color in the Catholic religion). INCENSE: Incense is lit on the eve of November 2 to guide the soul of the deceased to the altar. FOOD: Food is placed that in life liked the deceased, so that it recharges its forces in its return to the other world. FLOWERS OF CEMPASÚCHIL: Placed since pre-Columbian times as a symbol of respect for the deceased, crosses can also be formed with these. YELLOW Represents the strength of light and life. It also evokes the sun, which in the Aztec tradition, is believed to guide the souls of the deceased. The traditional cemetery flower is the one that gives this yellow color in the decorations. That is why the petals of cemeteries are used to make roads, to guide the dead to their offerings. PURPLE: Represents Christian mourning. When they arrived in America the Spaniards in the sixteenth century brought their own celebrations of the Day of the Dead Christian and European, where they remembered the dead on All Saints’ Day. 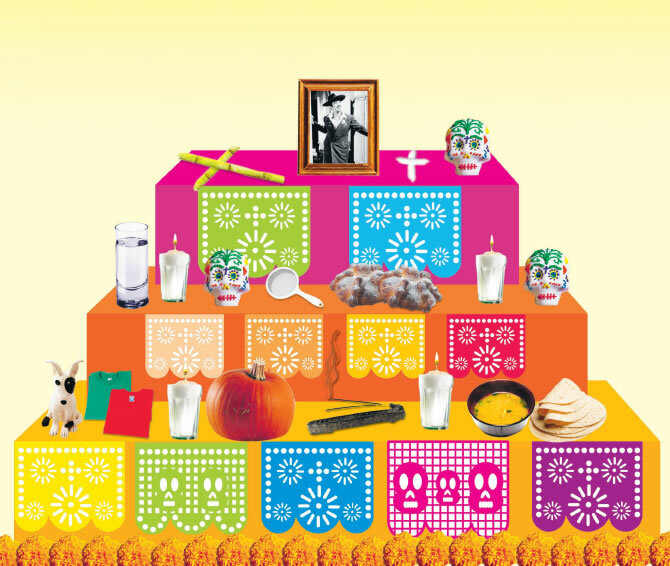 By turning the natives of the new world into a syncretism that blended the European and pre-Hispanic traditions, matching the Catholic festivities of All Saints’ Day and All Souls with the similar Mesoamerican festival, creating the present Day of the Dead and adding the purple color, which symbolizes Christian mourning in the celebration. BLACK: It refers to the pre-Hispanic religion, the Tlillan, the place of blackness, and Mictlán, that is, the site of the dead. WHITE It means light, innocence and purity. It is also used as a representation of the sky.The representation of each altar has its variations depending on each region of the country, but all agree that this rite is a gift to the ancestors and an invitation for them to visit. The seven steps of the alter: In the upper First step of this type of altars, the photograph of the favorite saint or of the virgin, or a cross is placed; in the second, there is the stamp of the souls of purgatory and in the third the salt. In the fourth step is placed the bread of death, and in the fifth the meals and dishes that are willing to offer the deceased. In the sixth step, the photo of the deceased person to whom the altar is dedicated is accommodated, and in the last one step, a cross of camandula, made of tejocote and limes. This altar also carries the four candles forming a cross, and includes a pot of clay olla de barro en un brasero, where aromatic herbs are put to clean the environment. There are also chains of purple and yellow paper, chopped colored paper Papel picado and three flowers, purple, yellow and white, symbolizing mourning, earth and sky, respectively. A new white canvas, which represents the purity of the spirit and the sky, is used as a tablecloth, and a single candle representing the soul of the deceased is accommodated. Maize and fruits are also offered as earthen offerings, as well as the favorite dishes of the deceased and sweet calaveras, thus representing the skull for the ancient Indians. The most familiar symbol of Dia De Los Muertos may be the calacas and calaveras (skeletons and skulls), which appear everywhere during the holiday: in candied sweets, sugar skulls, parade masks, and dolls. Calacas and calaveras are almost always portrayed as enjoying life, often in fancy clothes and entertaining situations. 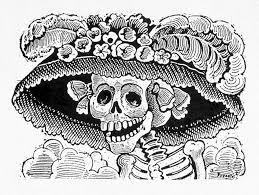 The most famous “La Catrina” was created by Jose Guadalupe Posada (2-2-1852 / 1-20-1913) Born in the section of San Marcos in the city of Aguascalientes, Zacatecas (In 1857 that part of Zacatecas was admitted as the state of Aguascalientes Mexico). At a young age, he showed his genius artistic flair for drawing. 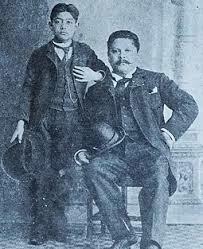 His brother Cirilo Posada, who was also his literacy teacher signed him up at the “El Esfuerzo”, an arts and crafts school. He bacame a lithography apprentice at the age of 18 at the printing press of Jose Trinidad Pedroza.The business grew to be the most important of its kind in the central part of Mexico.. Posada’s first illustration was in “El Jicote”, a newpaper with a political comical overtone to it. It was the first edition of El Jicote that Posada made his first illustration of death (1872). The image of small skeleton holding a scythe over a tombstone. Posada reputation grew rapidly, not just locally “Aguascalientes”(1852-1872)*, but also in the city of Leon, Guanajuato (1872-1888)*, and in Mexico City (1888-1913)*. In 1890 he joined the workshop of editor Antonio Vanegas Arroyo, whom he worked with until his death. They produced a wide range of publications and themes that were so diverse that he was celebrated as the graphic chronicler and illustrator of his time. It was during this period of his life that Posada fully developed what was to become the popular Mexican graphic art that we know today. 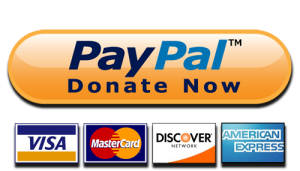 Posada artwork contains over 16,000 illustrations, lithographs, stamps, and artwork. The artistic “Genius of the Stamp” informed and entertained people through funny pictures that illustrated corridos and popular songs to stories of passionate crimes and gallant ladies in flyers that relate misery, love, greed, power, and death. One of his last engravings was the world renowned Calavera Garbancera (“Garbancera” to all those people who have indigenous blood, but pretended to be European, forgetting and not wanting to be part of their roots and their culture) later to be known as “Calavera Catrina (The Catrina Skull)”. The concept of La Catrina originated during the Porfiriato, between 1876 and 1910, when Porfirio Diaz was President of Mexico, as a criticism of the class binary in Mexico. Posada wanted to create a skeleton dressed extravagantly and elegantly to depict the Mexican women of the upper class during the Porfiriato. Posada said that “death is democratic. because at the end of the day , blonde or brunette, rich or poor everyone ends up as a skeleton in the end”. The most iconic Catrina was created in 1912 and published 10 months after Posada’s death on Januray 20th 1913. The image of La Catrina and its details are considered one of Mexico’s most iconic figures. Even though La Catrina is a skeleton, she symbolizes a tradition full of life with an extravagantly plumed sombrero tilted to the side and an elegant tight dress, La Catrina is a tall elegant, dignified female skeleton, eloquently stands as the center of attention in homes, restaurants, and museums all around Mexico and the world. La Catrina signifies death for Mexicans and there are different sizes, textures, and colors throughout Mexico and the world.. Even though La Catrina is now very popular, many people do not know its significance and they associate it with something dark, which is a mistake. La Catrina is something spiritual. Over time, “the social commentary that La Catrina portrayed, which originated in the changes of Mexico’s modernity, its corrupt government, the hypocrisy of the rich or the suffering of the poor, has been lost between the general public. La Catrina is a symbol of unity, distinction and cultural pride for Mexicans. La Catrina is a form of unifying humanity because at the end we will all be just skeletons. In Mexico, we have always had adoration and admiration for skeletons… We are not afraid, we love the bones that represent our ancestors.